When my older son was two, and ready to move from his crib, I made him a quilt for his first Big Boy Bed. 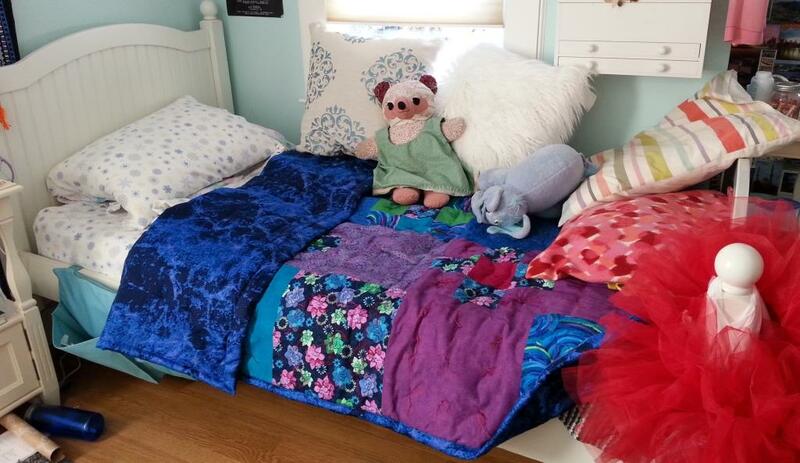 It was a simple nine-patch design in bright primary colors of calico, hand-tied with yellow yarn in the center of each square, and it stayed on that bed upstairs until the day when his daughter was in her turn ready for a Big Girl Bed. It migrated to a new locale and a new generation. When my grand-daughter K was four the quilt was shredding from much use. She and I went to a fabric shop and bought pink and purple fabric of her choice to patch the worst of the wear. 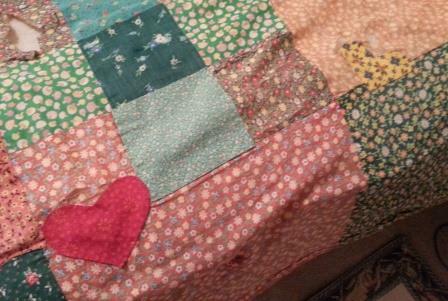 I cut the fabric into heart shapes and sewed the patches on by hand. A few weeks before Christmas I got an email from my son. 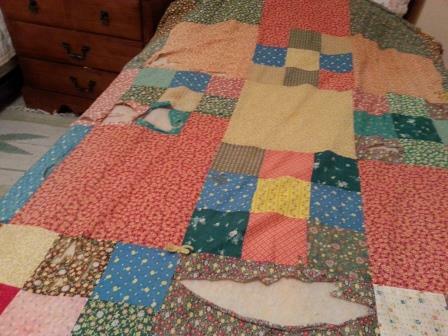 “K asked me last night, ‘Do you think Grandma would make me a new quilt?” Even heart-shaped patches had not managed to extend the life of the old one past an additional dozen years. I called K and asked if she had a color preference (“My room is blue, but it looks cold – I like deep reds and purples” ) and if she had an idea about floral prints vs stripes vs solid colors. (“You choose, Grandma – you have good taste.”) Warmed by the compliment from a fastidious 16-year-old, I plunged ahead, setting expectations not for a Christmas delivery, but maybe by Valentine’s Day. It had been some years since I had thought of making a full-size bed quilt. Walking into Eddie’s Quilting Bee was like entering Ali Baba’s treasure cave – so many beautiful fabrics and colors, in plaids, stripes, calicos, batiks, florals, oriental designs, silver and gilt overlays. Fortunately my eye was seized and held by a stylized graphic print of flowers in shades of pink, deep red, purple, teal, and green against a dark blue background. With this as a color template and the help of a shopkeeper who really knew her stock, I assembled an additional seven supporting fabrics. (“Isn’t that electric green a little much?” “No, it makes the whole thing pop!” “Is that swirl print too large?” “No, the colors are perfect!” ) I added batting – two layers, to make it cozy – embroidery floss in a rainbow of colors for tufting and tying, and was out the door, only slightly dazed by the hard cost of hand-crafting. I took it easy. A month later, with the help of my mother’s sewing machine, my sister who helped lay out the fabrics and sandwich the layers, and my mother’s caregivers who ironed seams and tied knots along with me around the dining table, it is done. And it is beautiful. Almost immediately a new challenge : my 7-year-old grandson asks, eyes alight, “Can I have K’s old quilt?” But it is faded and worn to tatters. Can any of it be salvaged? Let’s see what a doting grandma can do. 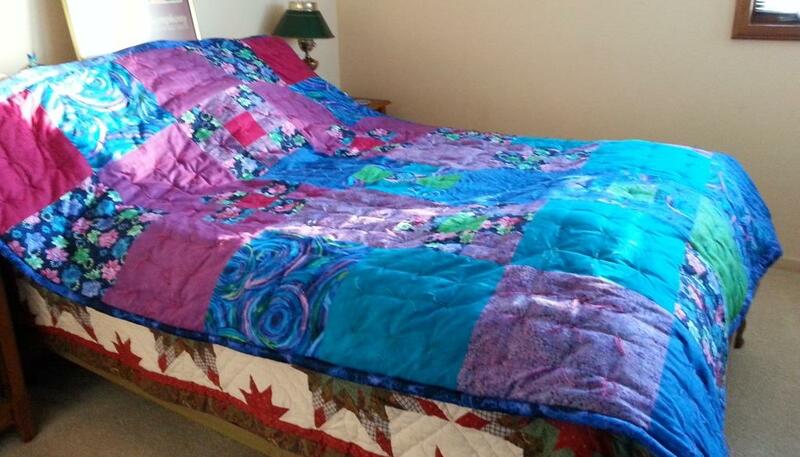 Posted in Memoir and tagged Saying "Yes"
The quilt is beautiful! The fabric perfectly meets the requirement to be both blue and to create a sense of warmth in the room. Thanks, Sheryl! I’m working on a pillow sham now.